From the trailer and the cast list I knew this was going to be good. I was wrong. It was excellent! The plot is quite simple and sharing something of it won't spoil things for you as this film is not plot driven but propelled with great force by the characters. 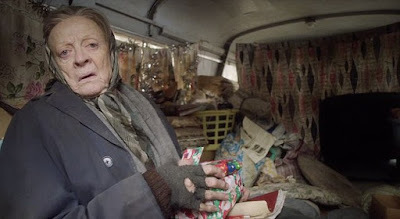 Originally a West End play (1999) the film is based on the true story of playwright Alan Bennett's encounter with an eccentric woman Miss Shepherd (Dame Maggie Smith) who lives in a camper van. After months of simply parking the van at the side of the pretentiously swanky suburban road in bohemian Camden in London - much to the annoyance of some of the local residents - the conflicted and indecisive Bennett invites her to park on his drive. She ends up being there for 15 years. Miss Shepherd is secretive and has an amazing past as a concert pianist and would-be nun. At one point she was committed to an asylum by her brother. The main reason for her lifestyle is that she fears arrest for murder in a hit-and-run accident that happened years ago. She is not allowed to forget the accident and feelings of guilt overwhelm her. Despite not making it as a nun, she regularly seeks the confessional and feels unable to receive God's forgiveness. Living life under perceived ongoing condemnation from God gnaws at her psyche and adds to her eccentricity - but even as a young woman, flashbacks show us that she was not easy to get along with. There are many moments of comedy in this film - but there are also many deep insights into human nature and the fears that drive us to irrational solutions to simple problems. The film evoked in me a constant stream of emotional responses which at times became a raging torrent. Maggie Smith is able to convey such depths of emotion simply by the way she holds her eyelids and gazes into the middle-distance. Alan Bennett, as all great writers, is a keen observer of life and the human condition, and writes with great humour and humanity to record the obvious which somehow would otherwise go unobserved. The acting by a strong ensemble cast is as good as it gets. The subject matter, the performances and the locations combine to produce a film that has a very English feel about it. It is simply exquisite cinema. As dominating as Maggie Smith's performance is, it needed to be set against an equally brilliant portrayal of Alan Bennett by Alex Jennings. Jennings plays two sides of Bennett's conflicted and divided personality - the person living in the real world and the detached and remote observer who is the playwright. Their extended dialogues are simply wonderful and the drole nasal Yorkshire intonation of Bennett provides an aural wallpaper that permeates every scene. This is without doubt a special film. The acting is top class and the whole dramatic presentation draws the audience in and evokes a strong response. Do go and see it - and then go and buy the disc once it is released. This kind of film-making deserves to be supported. I'll give it 9/10.